Copies of all complaints filed in any form against all coaches employed or volunteering in the Unit 5 school district for the last three years – 2015, 2016, 2017. Copies of all responses to the above complaints. I’m only going to post what is applicable to the football program. Note this are all from August of 2017, email addresses can be redacted, I don’t thinks names can be. I have no idea if these are tied to the November secret meeting. 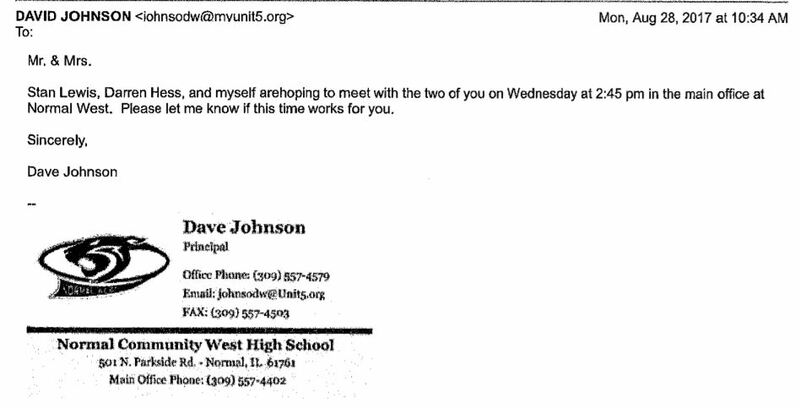 Posted in BloNo, Bloomington, Local, Normal, schools, Taxes.Tagged Coach Hess, complaints, football, parent emails, Unit 5. GOT ‘EM!…Great work Diane. I’d say the racism case collapsed as did the story of financial wrongdoing by the coaches. Its exactly what everyone already knew. 3 bullies tried to take down a school and failed miserably. Now the question is can they persuade Coach Hess to come out of “retirement”. What a bunch of clowns. Teams play on MERIT & PERFORMANCE! Not on “allotted time” schedules. WHAT if everyone did this? A high school game would last longer then the Super Bowl with ALL the commercials! Thanks Diane for sticking with this! I pity the employer that’s hires these young men in the future. Please do the employer a favor and let them know parents are included. They have trained their children when things don’t go your way, be sure to play the race card. “be sure to play the race card” And sadly, in today’s America, so totally perverted by political correctness, white guilt, BLM, Antifa and the Democratic Party, it works (almost) every time. A situation that affects us GRAVELY?? GRAVELY?? Thanks Diane for your hard work and your diligent efforts in bringing to light what the 15 already knew, that the 1 was doing, and that the school board was to afraid to admit. And was indeed using Coach Hess as their scrape goat!!. The school board should be ashamed of themselves!!!! The parents of this player ought to be ashamed of themselves!!! Unlike them, our GIC board and boosters, our coaches, our players, and the rest of the West supporters all have integrity, values, and do the right thing!! We support each other, and stand up for each other, as West football is a great family to be a part of!!! Diane we appreciate all that you have done in helping to resolve this story ,and for giving us a platform to make sure that the truth came out in the end!!! 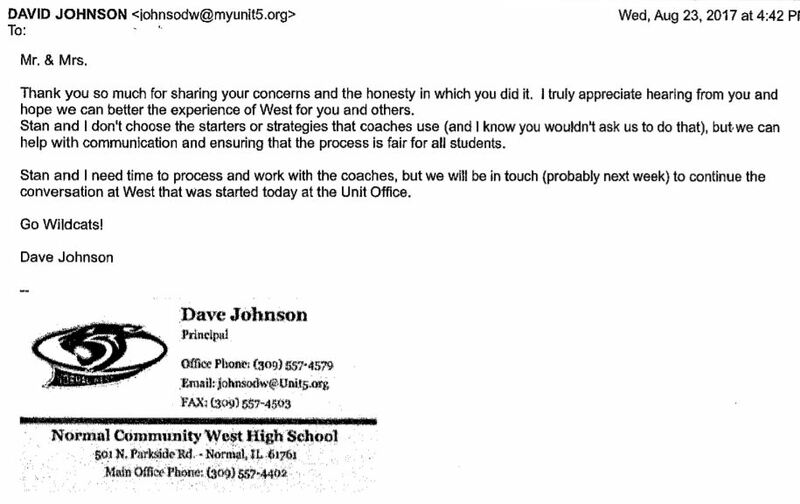 Now that the real truth is starting to come out, and the IHSA has no issue with Coach Hess coaching again. I know a lot of you as well as myself hope that Coach Hess will return to coaching at West. But this hard working dedicate man, has been put through the ringer a couple of times because of these entitlement perusing parents. And knowing that one of the previous entitlement parents has a son that could possibly be starting school next year at West. I have much respect, understanding, and admiration if Coach Hess indeed decided to go through with his resignation. With that being said, if he does indeed decide to not return to coaching at West as we all hope for……I would like to suggest that we send him out with his retiring from West football in the manner and the style that he truly deserves, and has earned, that a chosen few were trying to take away from him. As a casual observer looking at the (NFL) National Football League isn’t about 80% of the players black? Or how about the (NBA) National Basketball Association with even a higher percentage? I don’t hear any complaining about those numbers. Are those decisions of better players based on the color of one’s skin? I don’t think so. These players are the players with the higher skill levels and understanding of the game. People need to get over themselves. Perhaps they need to accept themselves as one of us/them and quit throwing the divide out there. 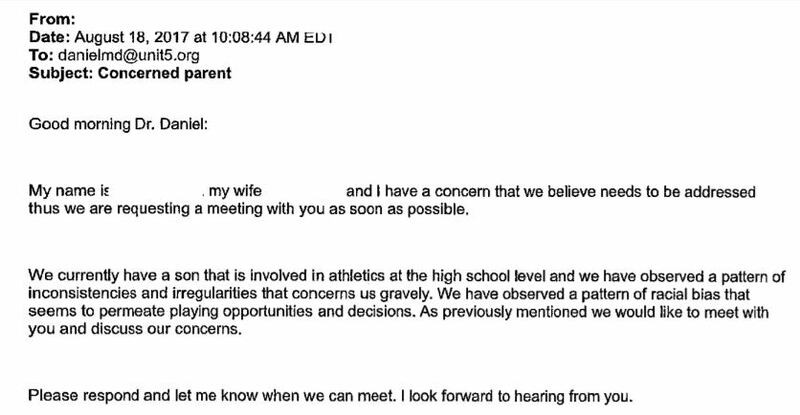 I would ask that their letter would have avoided the color issue and just get on with the facts of why their kid isn’t playing as much and what might be done to help him get there. Tossing in the race cards is much more effective with spineless leadership. I remember being on a church youth team, and being short NEVER got ANY playing time, but I KNOW that Jack Sikma and Doug Collins folks didn’t behave like this, MY how the times have changed. Actually was fun watching the two guys play! Maybe IF their folks had yelled DISCRIMINATION they might have become something-what ya think? Previous Post Nope, Laws don’t matter!